If while shopping around for a family trampoline you have visited one of your local big box retailers, you have likely come across the Bounce Pro Trampoline. The Bounce Pro, also written as BouncePro Trampoline, is very popular amongst the physical retailers such as Wal Mart, Sams Club etc. This coupled with the fact that it is a competitively priced trampoline compared to some of the other trampoline reviews on this site it makes it a trampoline that gets a lot of buzz. The cool thing about this trampoline is that it often comes equipped with an enclosure as well as an electron game. Normally, the Bounce Pro is sold in 14′ model but there are a few retailers that do offer a 15′ model. However, all our research in relation to the BouncePro will be in respect to the 14′ model. We should also mention that a particular model of the Bounce Pro Trampoline comes with a “Spinner Litez” option. This is an alternative option to the electron game which is offered on the model in this review. The Bounce Pro offers an excellent entry level trampoline for families, but again this is not intended for adults (especially heavier adults) to be jumping on it. Therefore, if you are purchasing this for children only this will do. In comparison to a Springfree trampoline, this is definitely not as safe, but it does offer excellent safety features for the price. The Enclosure as well as the UV resistant jumping mat will be sure to do its best at keeping your children on the trampoline and hopefully away from those springs. Who Is This Bounce Pro Trampoline For? The Bounce Pro Trampoline is for someone looking for an entry level trampoline suitable for children, yet offering “cool” bonus features. The materials used in this trampoline are not quite up to par when compared with a Skywalker or a Springfree, but you should get many years of enjoyment out of this thing without breaking the bank! The bounce factor of the Bounce Pro is fair. You certainly are not going to get the most air time out of this trampoline, but then again it is meant for children who should not be going that high in the first place. In order to get more life out of your trampoline taking care of it in the winter time by storing it in a location that limits snowfall will help to prolong the life of the springs. All in all this trampoline is a decent trampoline for the money. 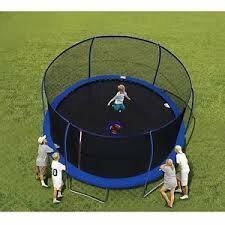 Usually this trampoline can be had for less that $300, which is about as cheap as you can go for a trampoline. Considering the fact that you are getting an enclosure frame with the netting for that price makes its an excellent choice for someone looking for an entry level trampoline .